Summer is here! If we dodge some of this rain we are getting, then it’s time for pool parties, end-of-school festivities, Canada Day barbeques, and backyard celebrations of summer. 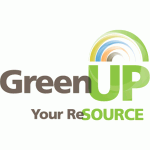 Each week, GreenUP provides a story related to the environment. This week’s story is by Karen Halley, GreenUP Communications & Marketing Specialist. Unfortunately, parties often mean excess waste. With a few simple actions, we can reduce our party footprint and enjoy the summer even more by knowing we are celebrating sustainably. Whether it is for a small intimate gathering at your home or a large outdoor soiree with your neighbours, there are many simple ways that your event can be greener than ever. You won’t be a party-pooper if you leave the balloons behind. While eliminating balloons from a party may initially seem like a downer, consider where they may end up after your party. Even when released unintentionally, fly-away balloons can have a detrimental affect on wildlife. Surveys of beaches across the globe show that the number of littered balloons has increased threefold in the last 10 years. Deflated balloons can be ingested by wildlife, entangled in limbs, and can contribute to litter in waterways and on beaches. Those attached to plastic or metallic ribbons are particularly problematic when ingested by turtles and other aquatic animals, as they become intertwined through animals’ digestive tracts. Instead, you can use fabric buntings, streamers, and ribbons that can be used over, and over again. Decorative tablecloths, lanterns, and seasonal flowers make great table settings. For kids’ parties, blow bubbles, make pinwheels and pom-poms, or make the whole neighbourhood smile with a surprise flock of pink flamingoes on the lawn for your next celebration. Over the summer, family and friends frequently gather together for picnics and barbeques. Meal planning is one of the most fun parts of any backyard party. When preparing your menu, consider ingredients that are grown or raised close to home. Fresh, seasonal vegetables and locally raised meat are plentiful in Peterborough. With a farmers’ market each Wednesday and Saturday you have two opportunities per week to stock up, and on Thursdays too, when you make the trip to the Lakefield market. Check out the City of Peterborough Community Services Map to find local food any time! The map shows you where the region’s farmers’ markets, food box programs, and farm gate sales are, and a lot more. The less distance your food has to travel from the farm to your plate, the smaller carbon footprint your party will have. If you are entertaining a private dinner in your own home, you likely have enough plates and silverware to accommodate all of your guests, but when you’re planning for larger numbers or hosting guests outside, it might seem tempting to go with disposables. Unfortunately, paper plates and plastic cutlery really add up in the garbage. If you are hosting friends often, you may want to invest in a back-up set of reusable dishes that you feel comfortable using outside. You can easily avoid disposables by giving a party rental company a call. Cutlery, dishes, and linens can all be ordered ahead and then you won’t have to deal with the pile of dirty dishes afterwards — an added bonus! Peterborough also has a ‘green dishes’ program through OPIRG that lends out dishes for a small charge. Visit opirgptbo.ca to connect with the service. When exchanging gifts or taking a token of thanks to a party host, think about how you can give the gift of green. Shopping local and purchasing gifts from artisans and crafters keeps your dollars circulating in the local economy, which is good for the whole community. Traditional wrapping paper and foil wraps cannot be recycled; think about how to incorporate re-usable giftwrap. A fabric bag or tote makes a great additional gift when used as wrapping, or you can use newspaper, brown post paper, and decorated boxes that can be recycled after their use. These environmentally friendly options are great when considering loot bags and party favours, too. Or, nix the kids’ loot bag all together and opt for a more cost-conscious take-home, such as hand-made bird houses, friendship bracelets, or books. Whether you have five guests or 25, sorting the recycling after a party is not fun. In Peterborough, have your two streams of recycling ready and labeled, prior to guests arriving. That way, all of the paper waste can go directly in one bin, while your containers such as glass bottles, pop cans, and food cartons can quickly go into a second — clean up will be a breeze. Composting your food scraps can significantly reduce food waste in your garbage, especially if you’re preparing a meal and snacks for a large group. Rinds, peels, cores, and skins from veggies and fruit can be easily composted. Recent food audits done in the County of Peterborough found that 15 per cent of garbage from households was wasted food. Sustain Ontario reports that in Canada, almost 50 per cent of total food production is wasted at the household level. Have your reusable food containers ready for packing up leftovers after the party. Leftover meals are great for future lunches, especially when you pack them up in single-serving sizes that can be grabbed quickly from the freezer and heated up at the office. Or send home some leftovers with your guests so that they can be quickly eaten up and not wasted. Twinkle lights and lanterns make any backyard complete. Have you made the switch to LED lights? Today, there are many LED and solar light options. They may cost more up front, but the energy and cost saving is significant. LED lights last much longer, with some lasting up to 25,000 hours, which is equivalent to 12 years. Watch for the EnergyStar label. Chances are strings of traditional bulbs won’t last nearly as long and they will surely cost you more to operate. If you’re planning to have a lot of guests at your party, you can opt for email invitations or use a social media platform to spread the news to friends. This will cut down on paper, and it’s free. For more intimate dinners and events, it certainly may be more personable to send a paper invitation. Many cards are available printed on environmental paper that has been recycled. If you have extra time, you may want to hand make your invitations. Your guests are there for a feast, not to be feasted on. There are a few tactics to try to prevent your guests from getting bugged out. Choose a breezy spot for your get-together where the air circulates well. Mosquitoes do not like a breeze and will avoid wind. Natural oil and citronella candles and coils are effective for deterring bites; place them close to the ground where mosquitoes hover as they avoid the wind. This will bring the scent and smoke between you and the mosquito, which will increase the effectiveness. Even better, plant mosquito-repelling plants in the garden. Lemon balm, catnip, basil, lavender, sage, and rosemary will naturally keep bugs at bay. And be sure to check the yard for any standing water, which can be breeding grounds for mosquito larvae. Commonly overlooked spots are in rain gutters, unused planters, and in the puddles that form in the pockets of a loosely wrapped tarpaulin. Enjoy your feasting, fun, and sun this season and make your summer parties better for your guests and the planet. For green gift ideas, reusable containers for leftovers, natural bug repellent, and lots of environmentally conscious items and options, visit the GreenUP Store at 378 Aylmer Street North in downtown Peterborough or visit greenup.on.ca. 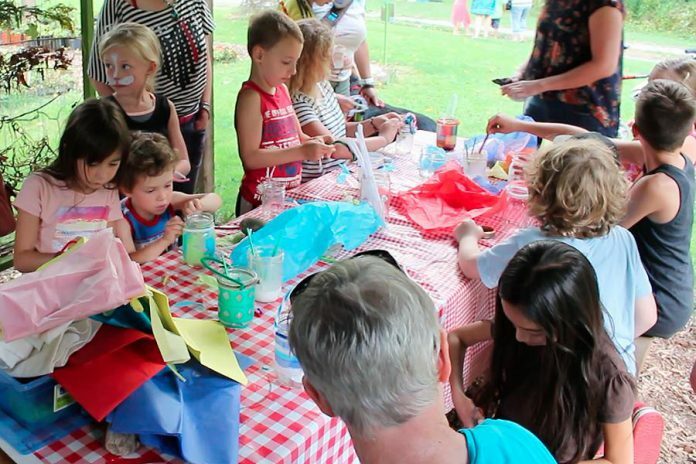 For a great eco-friendly, nature-based birthday party option for your child, consider holding it at GreenUP Ecology Park. For more information, contact our Education Programs Coordinator at danica.jarvis@greenup.on.ca.